Setting up a new Mac? Download and install your favorite apps all at once. GetMacApps.com makes it easy. From Dropbox to VLC, there’s a lot of apps you need for your workflow that don’t come with your Mac. Many are in the Mac App Store, meaning they’re quick to install, but a surprising number aren’t. So you do the installation dance. You download all the DMGs, you mount them, you drag the applications to the Applications folder, you unmount the DMG, then you finally delete the DMG. If you think this could be simpler, you’re right. Here’s a website that makes it easy for your to install a lot of the best Mac apps, all by running a single script. 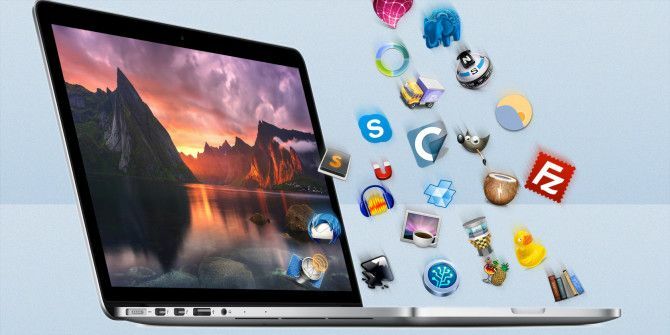 Head to GetMacApps.com and you’ll see a variety of software to choose from. Most major free programs can be found here. Browsers like Chrome and Firefox, communication apps like Adium and Skype, and a wide variety of tools useful for programmers. Each section is commented, so you can check it out – and possibly learn a few things. Basically, the software is downloaded and moved to your Applications folder. When the command is done, it’s done: you’ve got your software installed. It’s all in your Applications folder and ready to run. Gatekeeper, which helps keep your Mac safe What Is GateKeeper & How Does It Help Protect My Mac? [MakeUseOf Explains] What Is GateKeeper & How Does It Help Protect My Mac? [MakeUseOf Explains] Will your favorite programs ever run again? Certain programs won't load anymore - a message about Unidentified Developers shows up instead. There isn't even an obvious option to run the app. Gatekeeper just might be... Read More , will also stop you from running any of the software downloaded by GetMacApps. You’ll need to change your security settings to allow software from outside the Mac App Store to change that: head to System Preferences, click Security & Privacy and then on the General tab check “Allow applications downloaded from: Anywhere” (you will need to click the lock icon and input your administrator password first). Savvy Windows users know they can use Ninite to easily install all their favorite free apps in one installation Ninite - Easily Install All Your Favorite Free Apps In One Go Ninite - Easily Install All Your Favorite Free Apps In One Go Read More . I’ve long wondered why there was no equivalent service for Mac users. I’m glad it turns out there is. Do you know of any other tools that make setting up a new Mac simpler? Let fellow readers know in the comments below, okay? Personally, I never delete the DMG. I save them in a separate folder. Them, of something unexpected happens, such as an upgrade being less awesome that touted, I can easily delete and re-install the previous version. Periodically, I will go to the DMG folder and delete old versions, but only after I am confident they will not be needed. That's a pretty expansive strategy you've got there. If you don't mind me asking: how often do you end up reverting to old versions of software. Admittedly, not very often. When needed, though, it is really needed. Keeping the old .dmg is no problem and being in a folder with nothing else but those makes them easy to find and, on rare occasions, used. "Many are in the Mac App Store, meaning they’re quick to install, but a surprising number aren’t." Not really that surprising considering the restrictions App Store apps have. I see that Bodega was suggested, which I will recommend too. If you use Homebrew, there's also Cask. And to keep the apps updated I use Mac Informer. Although still in beta I had no problem updating my apps. Thanks for the heads-up! There was a / in the URL missing. Fixed. Justin, you rock. I wish I found this when I invested in my Macbook Pro last year. Sigh. And thanks for emphasizing the need to check scripts and not just blindly trust them. The Internet is not a safe place, and we need to be super careful with the services we use and the people we place our confidence in. I wish I'd found it earlier too, but on the plus side testing this out led me to becoming an Alfred user. Really happy about that. Wow, that's awesome. I've been waiting for a Mac version of Ninite to come about. Really glad to see something like this is finally created. If you're looking for Mac apps in general and don't care for the App Store, try using Bodega. It definitely showcases some of the free underdogs if you're looking for something specific. It's always been surprising to me that the Ninite team hasn't put together a Mac version. They did Linux, after all. I'm going to look into Bodega, thanks for the tip!